. :: ALL-TIMES / Tool integration ::. The ALL-TIMES project aims at combining and developing research results and timing tools currently available and thus to strengthen the European lead in the timing analysis area. The ALL-TIMES project has enabled the interoperability of tools from SMEs and universities, and developed integrated tool chains using open tool frameworks and interfaces. By combining research results and commercial tools, ALL-TIMES has promoted the flow of ideas from basic research to practice. This page shows some details of the tool integration work that has been done within ALL-TIMES. 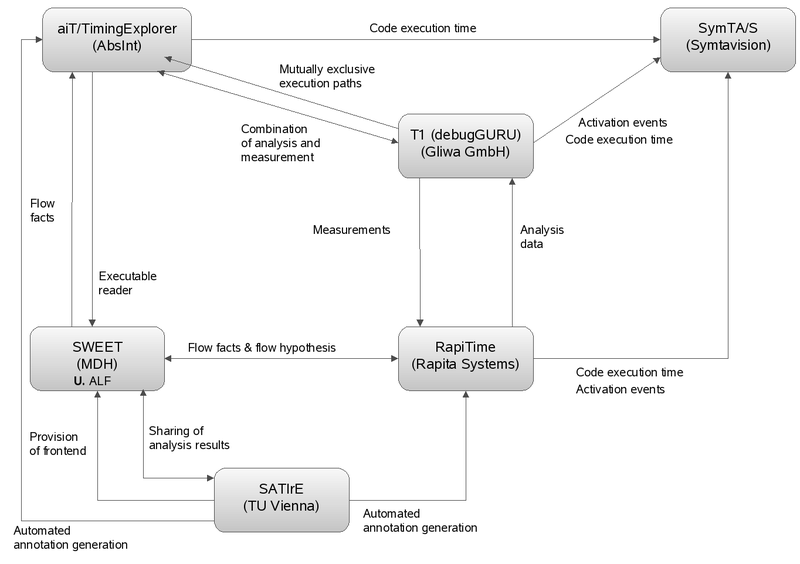 The diagram below shows the interactions between the tools that have been developed by the partners.